Spanish grammarian and liturgical poet; flourished in the first half of the eleventh century; a contemporary of Isaac Gikatilla and Isaac ibn Ḥalfon. 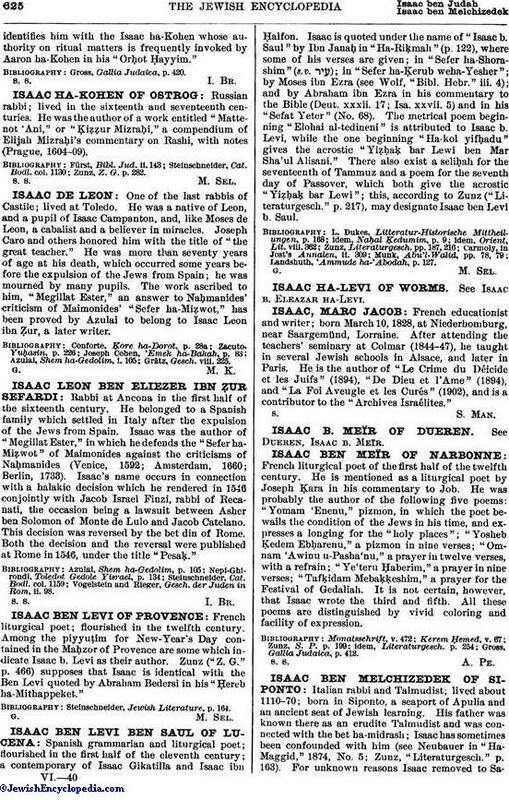 Isaac is quoted under the name of "Isaac b. Saul" by Ibn Janaḥ in "Ha-Riḳmah" (p. 122), where some of his verses are given; in "Sefer ha-Shorashim" (s.v. ); in "Sefer ha-Ḳerub weha-Yesher"; by Moses ibn Ezra (see Wolf, "Bibl. Hebr." iii. 4); and by Abraham ibn Ezra in his commentary to the Bible (Deut. xxxii. 17; Isa. xxvii. 5) and in his "Sefat Yeter" (No. 68). The metrical poem beginning "Elohai al-tedineni" is attributed to Isaac b. Levi, while the one beginning "Ha-kol yifḥadu" gives the acrostic "Yiẓḥaḳ bar Lewi ben Mar Sha'ul Alisani." There also exist a seliḥah for the seventeenth of Tammuz and a poem for the seventh day of Passover, which both give the acrostic "Yiẓḥaḳ bar Lewi"; this, according to Zunz ("Literaturgesch." p. 217), may designate Isaac ben Levi b. Saul. Landshuth, 'Ammude ha-'Abodah, p. 127.